Monday’s Monument: Theodore Roosevelt Island National Memorial, Washington, D.C. 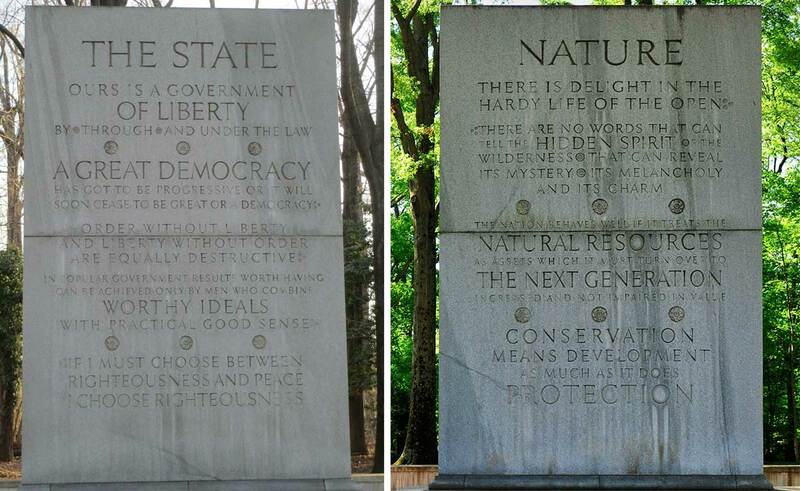 It is perhaps a stretch to call the Teddy Roosevelt memorial a peace monument, as the only reference to peace on the four slabs that are engraved with his quotations falls not on the side of peace. “If I must chose between righteousness and peace, I chose righteous,” he wrote in a 1915 essay on America and the World War. The 91-acre Roosevelt Island — in the middle of the Potomac River, accessible by a bridge on the Virginia side of the river not too far from the Kennedy Center — was acquired by the federal government in 1931 and re-imagined by landscape architect Frederick Law Olmsted, Jr. with the heavy lifting done by the Civilian Conservation Corps. It is startlingly wild for the well-groomed national capital area and is intended to be a place of reflection and communion with nature. There are two miles of hiking trails. Although a memorial was always in the plans, Congress did not appropriate funds for it until 1960. It was dedicated in 1966. The monument, designed by Eric Gugler, is in the northern center of the island. The centerpiece, a 17-foot-high statue of the 26th President, by sculptor Paul Manship, stands in front of a 30 foot high shaft of granite, overlooking an oval terrace. The four granite stelae are engraved with 17 quotations on four topics: Nature, Manhood, Youth, and the State. TR was such a rambunctious man: one would expect his monument to be of him charging up San Juan Hill with his Rough Riders or something equally bellicose. Instead, this is a place to reflect on our relationship with nature, on courage, character and liberty. In that we find peace.